← Congratulations Week 07-06-15-15 & 07-13-15 Giveaway Winners! First, thanks so much, Karen, for allowing me to visit with you and the gang here on your blog. My name is Kathy Ivan and I write a variety of books across several genres. I recently quit my full time job to write, but was a medical transcriptionist for more years than I like to admit. My very first job out of high school was working in a medical records department in a hospital in Key West, Florida. After that, I stayed in the medical field for the rest of my working career. While I wrote in high school, I never did anything serious about writing until I was living in Texas. Another woman who I worked with became a published author and invited me and another friend/coworker to a book signing. Afterward, she invited me to attend the local RWA Chapter (Dallas Area Romance Authors), and from there the writing bug struck again. My first book (Desperate Choices) was published in 2010 by Carina Press, and I haven’t stopped writing since. As I stated above, I got back into writing seriously around 2006, when I started attending a local RWA chapter. I studied voraciously to learn the craft of writing, worked on making my writing better all the time. I had published authors look at my work and give my critiques, which helped me hone my skills. And I wrote. And wrote. And wrote. Because you can’t get better if you’re not putting words on the page. I tend to be very plot driven when I’m writing romantic suspense. I like to have an idea of the story. I know certain things have to happen to lead the reader along until they get to the satisfying conclusion. This seemed to really work well for romantic suspense, because I get the best of both words—a mystery to be solved, and a happily-ever-after for my hero and heroine. I love making the people in my stories come alive. They are always surprising me, taking off in a totally different direction than what I anticipate, and that’s usually a great thing. But I have to say, I love writing the ending, because everything gets wrapped up, all the loose ends are pulled together, and the bad guy/gal gets caught. Plus, you’ll always have a happy ending with my books. Become a professional reader – maybe go into editing, because I could never leave the world of words behind. To me they are pure magic. Wow that’s a tough one. I think it’s different for each story. Sometimes the male character is the strongest, because it’s his story to tell. Other times, if the book is focusing on the heroine, then she’s easier. But I always love writing the villains, because they are so deliciously evil, and I love delving into them to find out what made them into the baddies they are. YES!!! If I don’t get to read at least a little bit during the day I start going into withdrawal. Right now, I’m reading a lot of paranormal romance, particularly shifter romance, which I don’t write. I’m a sucker for paranormal romance of any kind though, and some of my books have a paranormal thread running through them, although it’s not the main focus of the story. I’m a fairly eclectic reader, and read across multiple genres, as long as it’s a romance. Hmm, somewhere with a view of the water. A beach house or lake house overlooking a gorgeous view, but with all the luxuries. I’m not a roughing-it kind of gal. I’ve always been drawn to purple, the deeper and richer the better. I love the saturation of the tone and tend to have a lot of clothes that have purple in them. Plus amethyst is my birthstone. I write in two series right now. I have a book coming out the first week in August in the Lovin’ Las Vegas series called Vegas, Baby! (Each book in the series can be read as a standalone.) This is contemporary romance. The other series I write is romantic suspense, the New Orleans Connection Series, and I planning/hoping the next book will be out the end of September (for those who follow this series, this will be Carpenter’s “the ghost” book). 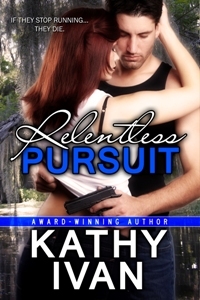 Be sure to come back to read more about Kathy and RELENTLESS PURSUIT on Wednesday’s Karen’s Killer Book Bench. Happy Reading! I love mysteries and suspense. Great interview!! I love that you would like to be a professional reader. That would be my dream job! Thank you for the intro to Kathy Ivan. Sounds like the kind of book I’d read. It seems she and I have many things in common: paranormal thread, romance, knowing the character dictates the story while being written and the beach/water living space with all the mod cons! Hi, Kathy, and thanks for stopping by Karen’s Killer Book Bench. It was fun interviewing you. We have a lot in common! Amethyst is not my birthstone (sadly) but it is my favorite stone, too. I could live on a beach, although I think I’d have to be independently wealthy because I can’t get ANY writing done when I’m on a beach. Call me lazy bones! Thanks so much everybody for the warm welcome. It’s been a crazy morning. I’ve been working with my cover artist on a new cover for one of the books in my Lovin’ Las Vegas series, plus getting ready for a new book that’s coming out in that series in just days! I love interacting with readers, I think most writers do, and visiting blogs like Karen’s is a great way to do that.